Yet another uniquely bound beauty from Blackheath Books. Their posse of authors I’ve had the pleasure of reading this year has been such a literary highlight. Excellent writers that have unknowingly kept me sane throughout the bombardment of mainstream pap that cold drips into ones life. 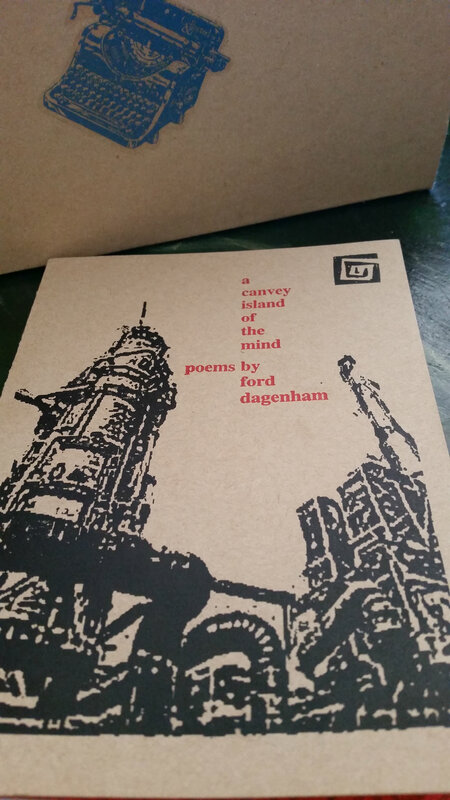 Ford Dagenham has been standing out in my brain since I glimpsed him via the pages of PUSH and Paper & Ink . A little search reveals publishing houses taking risks, and getting these writers on paper. It was through their zines that I stumbled upon Hatchbacks On Fire – a poem or pic a day until i die or don’t. My notifications always let’s me know that he is alive. I actually search out his daily fixes, straight to the source, a guaranteed mind ponder with my cuppa. Some writers become your morning newspaper, Ford is one of those. Admiring his prolificacy each post is one thing, but when one keeps delivering eye catchers day after day, that hold your attention, it just maddens and delights. Dagenham’s voice has a unique ache. So onto his collection of poems. I took Adelle Stripe‘s foreword advice, read it in inside a wrinkly hour in my bath. A Canvey Island Of The Mind published back in 2013, presses on your chest. ‘Canvey’ is a play on ‘Coney’ and baby, this is this sort of poetry I dig. Irregular outbursts, misshaped and random tackling life, death and love with a tantalising melancholy. He spends a lot of the lines through time spent at work. A job at the NHS is not for the weak hearted and you would quickly accumulate a backlog of stories. Where people are “slowly dying of hospital”. Ford takes the time to remember, to ponder and to get the facts and feelings all down. He has a way of taking you on a path where he will either present you flowers on bended knee or knife you in the gut with grief. I feel his pen frantically reminiscing his view on the day to day, his moments he shares of his working life are breathtaking. Often sinking back into what he is escaping from “I read the black abyss in the liquid ballroom” A Canvey Island Of The Mind takes you behind doors, physical and mental. Honest and brutal, Ford is a poet to follow. You can purchase this and many other unheard voices via Blackheath Books.